Very pretty morning sky the other day. Very subtle and pale, a cool end-of-winter morning. I did this one with my regular watercolours. I am not as happy with the photo though–the painting looks better in real life. 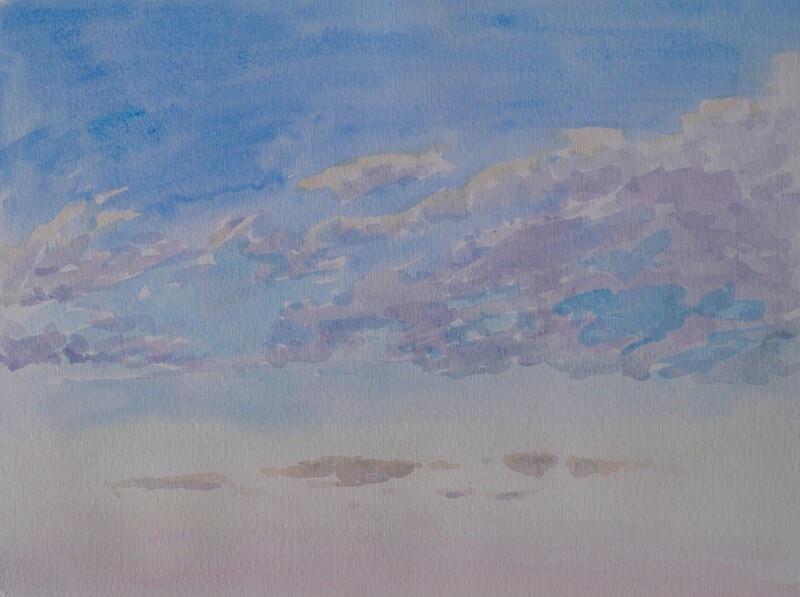 For this one I also painted right to the edge of the paper, which I don’t usually do with watercolours. I don’t know why I usually leave so much blank space, but I’ve become more conscious of it lately and feel like I need to “finish” them. I also did a quick second study with the watercolour pens to try it out, but they weren’t quite right for capturing the pale colours. I will have to try using the pens when there is a super vibrant sunset. The pens are much faster to work with so that might actually be perfect. 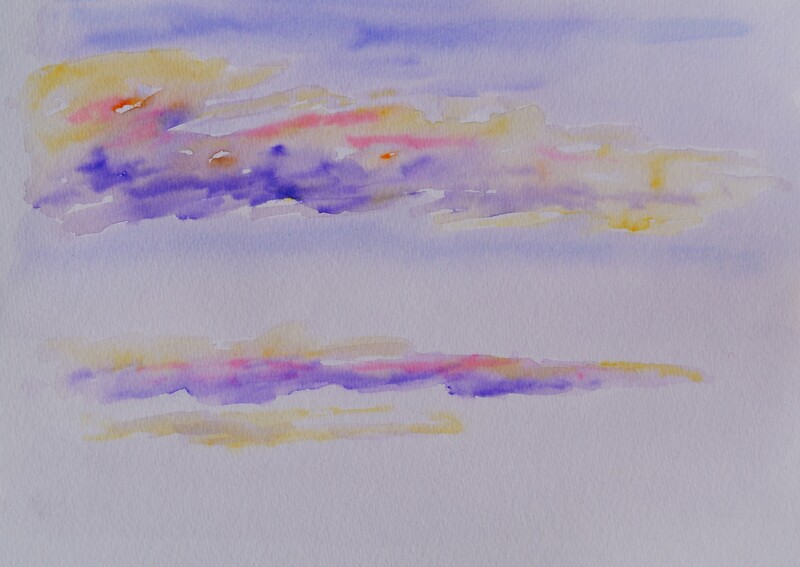 Here is the super quick watercolour pen one (which isn’t true to what the real sky colours were). I’ve been experimenting with using the watercolour pens with other subject matter, but so far they have worked best with the flowers. The pens are so vibrant. Maybe I will try using both the pens and my regular watercolours in a painting. Last week I tried to do a painting of the big tree across the back alley using the pens, but it was very strange. I still can’t bring myself to post that one. It really was like learning to paint all over again. Just catching up on your recent work athough I’ve been watching the pens for awhile…pretty interesting and the idea of combining them sounds promising. Maybe you already have and I will come across it as I browse more. Re:the above, seeing your work through a photo and then a post of it to/through the computer, isn’t the same as seeing the actual painting. I know that in the transition, vibrancy is often somewhat diminished. Anyway, I like these and appreciate the different, umm…media (?). I prefer the top one I think because I’ve an idea of what it looks like in the natural. I remember all those from last year and how there was “more” to them when seeing the originals. It was also immediately noticed by Meredith.